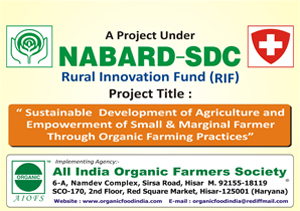 Rural Innovation Fund (RIF) project entitle "Sustainable Development of Agriculture and Empowerment of Small and Marginal Farmersthrough Organic Farming Practices" under RIF Scheme of NABARD-SDC (National Bank for Agriculture and Rural Development - Swiss Agency for Development & Cooperation). THEME OF THE PROJECT IS To Sow - To Procure - To Certify - To Market THE PRODUCE SO PRODUCEDThrough this AIOFS is giving Organic Farming training to 675 Farmers of 35 Villages and also getting them Certified Organically from LACON - Germany. We are also motivating these farmers to adopt Participatory Guarantee System (PGS) (A very Innovative and Zero Budget System of Organic Farming initated by NCOF- National Centre of Organic Farming. So that they can remain certified forever without any cost.